This is my review of the Green Elephant organic restaurant. People today are becoming more and more unhealthy, constantly in the news there are new reports growing health problems caused by obesity. In wake of this junk food wave there are a growing number of people trying to eat healthy and there are an increasing number of organic vegetarian and vegan restaurants popping up all over the nation. I had the pleasure of dining in one of these healthy organic restaurants while visiting Portland, Maine. The restaurant is called the Green Elephant and it was absolutely delicious. Its boasts an organic menu, with all their dishes freshly prepared, but the wait is surprisingly short. This was my first organic, vegan meal and I expected it to be bland and I was going to have to force it down. To my surprise it was very tasty and I finished my plate with no problem. I also enjoyed knowing that everything I ate was natural and good for me. 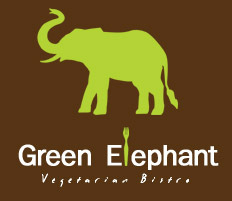 I would highly recommend The Green Elephant organic restaurant, and eating organic again. I have been pummeled by comments from this site about which restaurants are best to eat in. It pleases me that people are trying to eat healthier food, but chagrins me that no one has extolled the virtue of eating at home, especially when one picks the ingredients from one's own garden. Too few Americans are familiar with the works of Barbara McClintock (Nobelist) and Anastasia (Russian) and how the works of these two outstanding women can have a salubrious impact on their health. Barbara showed that plants have "jumping genes". How is this important? When genes move between generations of a plant, they produce different proteins. These new proteins are in response to the stimulants received by the plant. Stimulants such as the excretions (sweat, toxins, dead skin, etc) from the gardeners. The new proteins are designed to counteract any bodily conditions of the gardener to create a healthier body. I call this process "The Plant as Doctor". But the plant is not just the doctor: it is a Lab Tech analyzing the toxins, a doctor writing a prescription to counteract the toxins, a Pharmacist filling a prescription, and a Clerk packaging the prescription in an attractive and delicious package for the patient to ingest after appropriate preparation. Now, can anyone tell me how eating at a restaurant, any restaurant, can beat cooking and eating at home using such important ingredients, custom-designed for YOU? The information about how plants interact to your personal sowing (placing seeds in mouth to absorb your bodily fluids, warming them in your hands with salive), tilling and weeding by hands whose sweat infuses the soil the plants feed from, etc, comes not from McClintock who was a geneticist, but from Anastasia who lives in the tiaga Cedar forests of Siberia, Russia. Through her influence, millions of Russians today are going back to small family gardens for almost all of their fruits and vegetables, even city dwellers who plant and harvest from their dachas in the countryside. Anna-Staseea is how you pronounce her name correctly and a quick Google of her name and Ringing Cedars will give you a lot of healthful information to chew on.